What It’s About: Zatoichi (Shintaro Katsu), the blind masseuse who is also a gambler and expert swordsman, returns one year after the events of The Tale of Zatoichi to pay his respects at the grave of Hirate, the honorable swordsman he was forced to kill. Along the way he is protected from those who would kill him by a mysterious one-armed rogue (Tomisaburo Wakayama). He also learns that a powerful lord (Fujio Harumoto) is mad along the way, and soon the lord’s men (and his enemies in town) are attempting to kill him. Why Watch it Today? : Today is World Sight Day, which brings attention to blindness and vision impairment. Zatoichi, originated by Shintaro Katsu is not only a great blind character, but also a very long running one, appearing in over 25 films and a short-lived TV series. 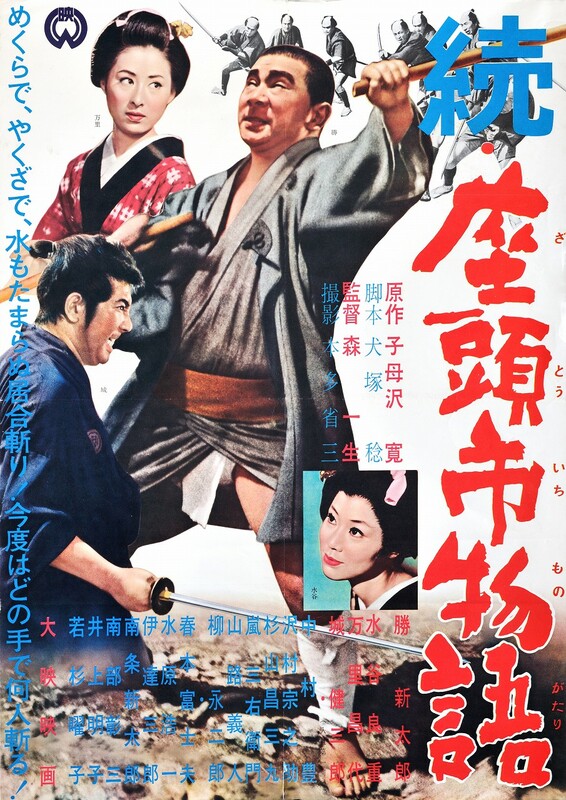 Although most often brought up by fans of Japanese Chanbara (sword fighting) films, most Zatoichi films also feature the lead character outwitting, out gambling and occasionally out wrestling or out drinking his opponents, mixing comedy and drama along with a poignant sense of humanity (at least in the early entries such as this one). Other Choices: We’ve previously featured Zatoichi the Fugitive and the lone attempt to Americanize the concept, the off kilter Blind Fury starring Rutger Hauer. This entry was posted in "Foreign Film", Action, Adventure, Arthouse, Black and White, Chanbara, Drama, Jidaigeki, Martial Arts, Melodrama, Movie of the Day, Period Film, Road Trip and tagged blind, brothers, Daiei, double cross, insanity, Japan, masseuse, master swordsman, samurai swords, Shintaro Katsu, sword cane, wanderer, Yakuza, Zatoichi.